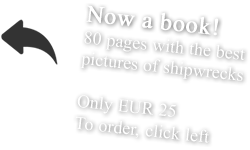 Why a web site about shipwrecks? Some people admire the view of a once beautiful ship slowly decaying on a lonely beach, but, for others it’s just an eyesore – a heap of rust spoiling nature. Obviously, I belong to the first category. I became interested for the first time about shipwrecks when I lived in Aden (Yemen) close to a port with abandoned ships. This was in 1984. Now nearly 30 years later, I still like shipwrecks and why is that? It is mainly the fun of adventurous travelling to find them which keeps the excitement in me going. Shipwrecks can be found on deserted beaches, on coral reefs in the middle of the ocean, at restricted diamond areas, uninhabited islands or other remote & uncivilized places. So the trip to a wreck is often more interesting than the wreck itself. Fortunately, shipwrecks are not yet included in tours operators’ programme. 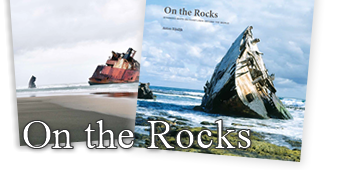 The story behind the wrecks is divers. There are war casualties (the Japanese wrecks in Indonesia), victims of bad weather or navigational error. Some ships were abandoned on the beach or in the port, one was left in the port loaded with toxic waste (Gambia), others are on scrap yards (Alang Beach, India). This web site for my own practical purposes solves the problem of safe-keeping pictures stored in bulging shoe boxes and overflowing hard disk. In so doing, I also take the pleasure of sharing the excitement of treasure-hunting shipwrecks.